Originally published by Köln gegen Rechts Facebook page. Edited machine translation by Enough 14. Only one week after the protests in Cologne Kalk, about 750 people demonstrated again in Cologne. This time against a public event of the AfD in the VHS Forum in the Rautenstrauch-Joest-Museum. Supported by the Autonomous Center, which celebrates its 9th anniversary today, about 750 people moved from there to the vicinity of the museum. The demonstration was accompanied by a large contingent of police. Arriving at Neumarkt, the demonstrators were first denied access to the museum, despite prior notice. In addition, police troops stormed the demonstration several times and arrested at least three people, without there having been any reason to do so at the demonstration. During a rally behind the museum, Last weekends police operation in Kalk was again pointed out, The cops had repeatedly beaten counter-demonstrators waiting at the entrance to let an AFD group in. Also this time, the AfD and probably also the museum did not take it so seriously with the equal chances to enter the building. So also this time about 20-25 Afdlers were let into the museum before official admission. Over time, many AfD opponents gathered in front of the museum and lined up at the entrance. Here, too, AfDers tried to push their way forward, but in most cases this could be prevented. An AfD member in line then ran around with lots of advertising for the Antifa. In the hall itself the AfD was apparently afraid of the public again. There were clearly fewer chairs than the hall had capacity. So it happened that the only 30 AfDlers present (including former Pro Köln functionaries like Bernd Schöppe) faced only a fourfold number of opponents. 100 further AfD opponents/inside before the hall were not let in any more. However also a few of their party members had to remain outside, which could not believe not to be beaten past the line this time. At the delayed start of the event, due to the slow admission, there was again a lot of applause. Obviously too much for the AfD. 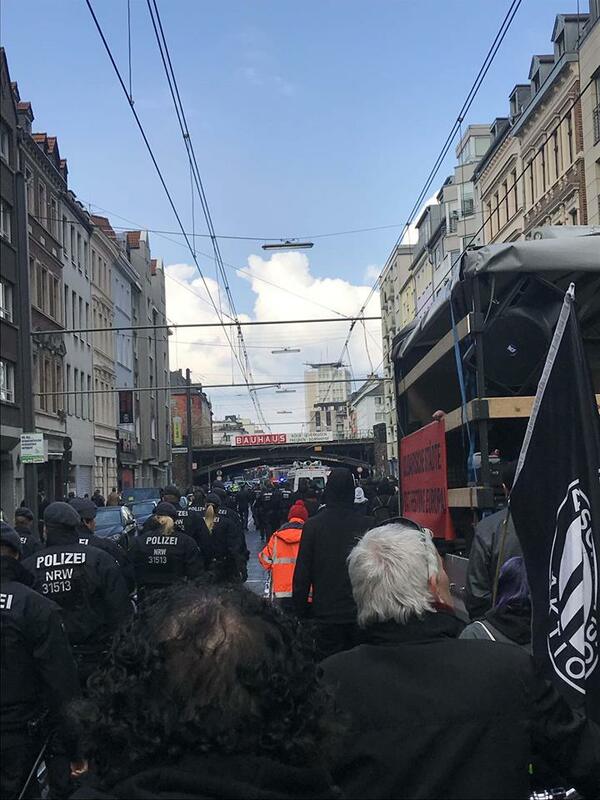 The AfD again went through the ranks together with the police and kicked many participants out of their event. Police units from Düsseldorf and Mönchengladbach, who were obviously not familiar with Cologne customs, filed charges for throwing confetti!!! At the end the hall emptied increasingly and a small bunch of AfDlers ended the event frustrated. Participants of the event who applauded loudly received a complaint from the police about trespassing. The participants in Kalk have also received subpoenas from the police. You don’t have to and shouldn’t go there. In the next days we will give more information from a lawyer’s point of view. Many thanks to the many people who have once again shown that we will continue to oppose racist parties and events in Cologne. And have fun at the birthday parties Autonomous Center Cologne (Warning Facebook link).